When people are trying to lose weight and shred fat their main goal to long-term weight management should be to raise their metabolism (rate in which your body uses energy). What most people fail to realize is that their hydration level directly affects their metabolism. Water is involved with almost every biological function in the body, so therefore your body’s metabolism slows down in a dehydrated state. When your body does not have adequate amounts of water, your calorie burning machines (muscles) slow down dramatically. Over 70% of your muscle consists of water, so when they are not fully hydrated their ability to generate energy is severely inhibited. Another important factor to understand is – your body’s ability to utilize fat as fuel is also restricted when you are in a dehydrated state. Combine these two factors and you have one slow metabolism! The list of negative side effects to your metabolism due to dehydration is endless. The effect of dehydration is often overlooked, and in fact it should be one of the priorities of any healthy eating plan. 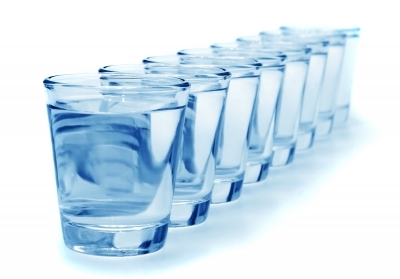 Taking in a sufficient amount of water, is the first step in assuring your metabolism is working at its optimal level. You should be drinking a minimum 64 oz. of water each day. Remember, your body can’t distinguish between hunger and thirst, so when your tummy is rumbling and you think it’s in need of food, it could just be telling you that it needs some water. Have a big glass of water first and if you are still hungry 15 minutes later then have something to eat. If you’re thinking my mouth gets dry when I’m thirsty, that’s how I can tell, then give this a thought…once your mouth gets dry and you feel thirsty, you are already dehydrated; therefore, your body and your metabolism are already in a sluggish, dehydrated state! I hope that makes you think twice about how much water you intake each day! One of the best ways to make sure you are getting at least 64 oz. is to fill a bottle or jug with your goal intake amount and make sure it’s gone by the end of the day! Just remember you will need more on the days you exercise and/or are in the hot weather!